Can You Cook Pork Two Days After Expiration? A foul-smelling cut of pork isn't necessarily destined for the garbage. 1 How Long Does It Take for Pork to Spoil When Not Refrigerated? 3 How Do I Tell If Pork Has Turned Bad? 4 Can You Cook Pork Two Days After Expiration? Avoiding foul-smelling meat like the plague might be our knee-jerk reaction to the threat of foodborne illness, but the truth about spoiled meat might surprise you. There are two categories of bacteria that can live on pork: one that makes meat look and smell bad, and one that makes you sick. It's the latter category you really need to worry about, but you often can't detect it, which means that proper food handling is still essential to keep you and your family safe. A sour or off odor is a major warning flag that pork has spoiled; another indication is a change in color, usually from pink to brown or grey. This type of spoilage bacteria will probably not make you sick if you cook the pork to an internal temperature of 145 degrees Fahrenheit -- or 160 F for ground pork. Another type of bacteria, however, called pathogenic bacteria, does not cause discernible changes to the meat, but can cause illness. For this reason, proper handling of pork is essential. 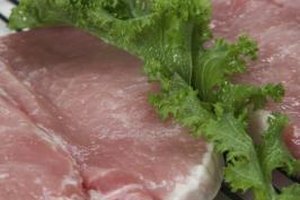 Keep in mind that raw pork will last up to two days past the date marked on the package if refrigerated constantly; if frozen before this point, it will last indefinitely -- although the texture may change if frozen for longer than six months. Keep the pork in its original packaging, or in an airtight container, to prevent contamination and exposure to moisture. Eat By Date: How Long Does Pork Last? USDA Food Safety and Inspection Service: Do Spoilage Bacteria Make People Sick? What Does It Mean When Hamburger Smells Like Vinegar?